What if your gala netted an extra $1,000 this year? For many nonprofits, that’s a significant amount of money that could be put to good use paying staff, buying much needed equipment or running programs. 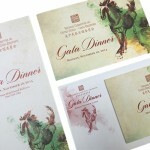 The place to start looking for that extra money is practically under your nose in your gala print package. How to keep postage restrictions from killing your nonprofit concept. Monaco Lange was determined to do something great, but if you’ve ever done an invitation for a nonprofit, you know the challenges they faced.